As part of the blitz of new announcements from Google this past Monday, Google also introduced what they call the Topic Layer in the Knowledge Graph. With that, they can also dynamically categorize knowledge panels based on sub-categories and topics to better provide search answers to their users. Google said they have taken their "existing Knowledge Graph - which understands connections between people, places, things and facts about them - and added a new layer, called the Topic Layer, engineered to deeply understand a topic space and how interests can develop over time as familiarity and expertise grow." The Topic Layer is built by analyzing all the content that exists on the web for a given topic and develops hundreds and thousands of subtopics. For these subtopics, we can identify the most relevant articles and videos - the ones that have shown themselves to be evergreen and continually useful, as well as fresh content on the topic, Google said. "We then look at patterns to understand how these subtopics relate to each other, so we can more intelligently surface the type of content you might want to explore next," they added. Here is how the dynamic organization of the search knowledge panels work now. 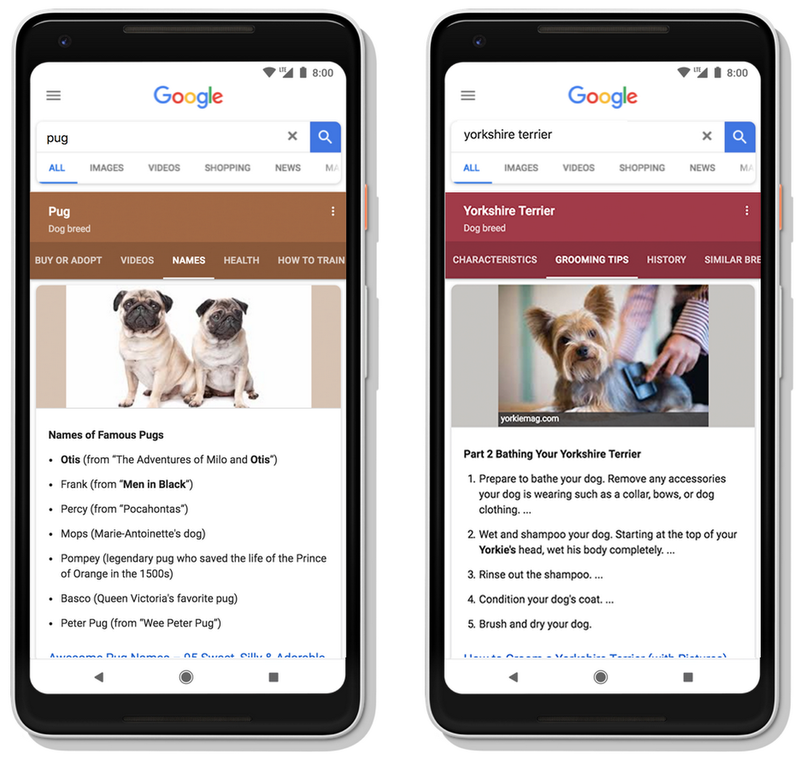 "Rather than presenting information within a set of predetermined categories," Google said they "can intelligently show the subtopics that are most relevant to what you’re searching for and make it easy to explore information from the web, all with a single search."